I have noticed two trends in the computer accessories business that tie in to this review. The first is that there seems to be an over abundance of laptop coolers on the market. They now come in all sorts of styles and sizes, and you could probably stay quite busy reviewing nothing else if you really wanted to. The second is that many traditional computer accessory manufacturers have now launched subsidiaries with more narrowly targeted product lines. Sunbeam has Tuniq, Thermaltake has LUXA2, and now Cooler Master has Choiix. Choiix was officially launched in the spring of 2008, and the name was chosen based on the French word for choice. Like so many other tech products these days there is a superfluous "i" thrown in, but at least they were somewhat original and didn't just slap it at the front. The product provided for review is the Choiix C-HL01-WS Air-Through laptop cooling pad shown in the promotional image below. While I had started to think I had seen just about every way you might cool a laptop, we have a new twist here. The plastic framed 'pad' has a large opening in the middle, and two 60mm fans mounted at the back which direct cool air in to this area. Considering that the bulk of the hot components will be located in this well cooled, open area, it will be interesting to see just how well this design will perform. Before taking a closer look at the sample provided for review, let's take a look at some published data regarding the C-HL01-WS Air-Through laptop cooling pad taken from the official product page on the Choiix website. » Optimally designed for the slim and light notebook. 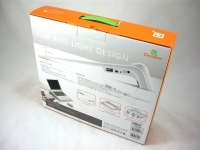 The C-HL01-WS is sold in the well detailed cardboard box shown below. While it is extremely lightweight, the overall size tips me off that this might not be the most portable laptop cooler. While many coolers fold up to be easily transported with the laptop, others are intended for a more sedentary existence. AS we will see, this cooler isn't really meant for traveling. Inside the box we find the cooler, a USB extension cable, and a brief user's guide (not shown). 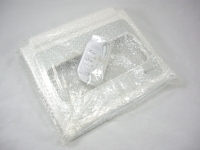 Not only is the cooler well protected by the box itself, but it is wrapped in bubble wrap and sealed inside a plastic bag.